My journey into hoof health continues. So one full season and two half seasons. I don’t think it’s my imagination that her legs look stronger, thicker and more proportional now than in this picture from September 2016 (I see an even bigger difference in the hinds here). Until now I’ve been working with a rasp and a woodworking file tool only as I felt the changes were minimal enough that I couldn’t do any drastic damage too quickly that I might with nippers or a knife. I have a lot to learn but keep trying to understand the mechanics of the foot and read as much as I can as well as working on a few actual horses with some initial direction from a mentor and seeing how my eyes steer me over weeks and months. The good news is that K hasn’t had any true lameness issues from going barefoot and hasn’t been trim sore in months. I’ve been working on her feet every couple of weeks in small maintenance trims and am now much better at watching how her feet change. Because she’s more flat footed than any of the other horses I’m working with, I’ve come to decide she would benefit from better removal of some of the dead sole than my current tools were allowing for. I suppose it was time to get myself a hoof knife. It wasn’t quite as big a deal as I’d worried it might be. I wear gloves because my concern was only in small part screwing up my horse- the bigger part was slicing myself! One thing I’ve been told and read is that dead sole will come out pretty easily and live sole takes a lot of pressure to cut through. My aim was to try to remove some of the dead sole to give a little more concavity andtake the bars just slightly done to basically sole level. My hoof trimming work is anchored currently in the ‘first do no harm’ mindset and though I’m quite pleased with how her feet came out of my mini-trim it is far from beautiful work! The first hoof I was working left handed with a right handed knife (this took me a little while to realize) and the paring out was small rough little patches. None of them are deep and I think it will get the job done but it’s not particularly pretty. I was pleased to find that the dead sole did take a little effort to remove but wasn’t difficult. The thin layer I started with will help ensure she doesn’t have as much dead sole causing pressure spots that are even with the hoof walls. I got a little handier with the knife as I went along. Walking her back to pasture she was moving fine on all surfaces (pavement, hard pack and grass) at walk and trot. I’ll see how she’s doing as the days go by and if she’s at all tender (I’d be surprised as I was so conservative this time). I can’t imagine going barefoot and taking on your own trimming is the right choice for everyone, but I’m glad to be in this position for the moment as I like being able to have more hands on control week to week instead of going on a 4-6 week trim cycle. I’m thankful to Scoot Boots not only for a great easy to use boot that stays on for us making barefoot even possible- but also for their barefoot information and blog that gave me the courage to try! Without question this is a whole horse picture and none of the factors are stand alone. Good nutrition, body work to be sure she can move her best, work on my riding to do the least harm when riding her (effecting her natural movement), a saddle that goes beyond a good fit to encourage building topline, and next stop will be looking into different schools of equine dentistry and how the teeth have an effect on the entire body and how the horse moves. I suppose I’m also grateful for endurance riding that has been the catalyst for finding the best instead of what works- the journey has been eye opening for sure but also really fascinating! Three weeks since a blog post! I’ve been at the barn but not riding so much. For a few weeks my horse program has felt on the fritz and my real work has been ramping up and needing extra attention. So I gave my mares some time to be horses and the time I had with them was directed toward to finding new ideas to learn together … like backing over pool noodles … mostly to continue communication and do something out of the ordinary. One day a couple weeks ago I went to bring K in for a quick check and to treat a cut – something was wrong. Just walking was a struggle. I wondered if she’d gotten kicked, slipped and had pulled something in her hind… developed an internal infection…. in sending a quick video text to my vet (what did we do before video texting??) she said her first reaction was early lamanitic pain 😳😬 and her first suggestion was to get her off the grass then see how she does. It was right in that cold spell where temps were dipping into the low 40s at night but still warm in the day. When the fall grasses begin to go into desperation mode and increase sugars again. The electric fence went up immediately and now the mares are super restricted until the first hard frost. They can eat what grass they have access to and I’ve started throwing hay too so they are transitioning. If they get thin (no evidence this is a concern anytime soon) they’ll get more coolstance which adds fats and protein. Whatever the issue was it was gone by the next day and she was back to… almost normal. Still- she hasn’t seemed quite right most of this summer. Occasionally lethargic, less interested in working. Off and on. Not off enough to do anything but pay attention. But off enough that I didn’t push the riding I would normally be doing this time of year. In the back of my mind I remembered I’d heard the nutrition change can come with a detox period and that it can cycle over time getting better or worse in phases until their system changes over. So there could be a detox factor potentially at play. When it comes to her feet I’ve been really happy with the changes but it takes time to come back from being in shoes the majority of the year (for a few years) and not being trimmed to optimally support her movement and structures. She is growing more (faster) and healthier hoof this year and the soles are really starting to look good! Her hoof tends to grow out instead of underneath her (conical) genetically which (if I over simplify) stretches the sole out instead of holding natural concavity. The two things I’m working on the most with her front feet are constantly keeping the toe from getting long (every cm creates hundreds of pounds of additional pressure on the leg’s suspensory system) and helping remove any dead sole underneath that may create sole pressure without taking too much that she needs to develop healthy hard sole. She hasn’t been completely sound if I ride her barefoot (like in the grass in the yard) but she’s also not lame. She’s fine… then she’s not fine… then she’s ok then she’s not quite ok… sometimes I’m certain I’ve turned into a lameness hypochondriac and am creating issues that don’t exist! Either way she wasn’t doing well in shoes and pads earlier this year so we are still moving forward and at least building better hoof now. The scoot boots are doing a terrific job and I’ve added easycare pads and modified the back and rear sides per a cool video I saw recently on Facebook. I didn’t have rubbing issues but this can only help- especially as I begin to take them over longer distances when the rubbing could present even if my shorter rides haven’t created issues. Anyone using scoots who wants to check out the modified design can see it here: Padded collar mod As time went on I took her out on some less intense rides and she seemed ok… but sometimes she’d be practically falling apart underneath me… then she’s fine. I’d feel her landing wrong in a trot… taking bad steps and then be fine. I’d ask my friends: does she seem off to you? No… she’s fine now… then off then fine… then off then fine. A couple miles trotting on a dirt road no problem after seeming like she couldn’t get her feet underneath her 10 minutes earlier. Ay-ya-yay.my mind I’ve reflected on the number of pretty significant changes that have come at that mare this year and try to put it into perspective. Removed shoes and aggressively changed her angles and toe/heel to better support her. Switched from traditional saddle to a constructive saddle with the Balance. Changed her bit (I don’t always use a bit but I picked up a simple D ring French link snaffle for her especially when working on specific training as opposed to long mileage conditioning). Changed her nutrition removing her from all grain based commercial feeds and added a probiotic when I found her hindgut wasn’t digesting nutrients properly. Herd change: Faygo moved to Reno this summer. They’ll be fine, but it’s still a major adjustment. Me. 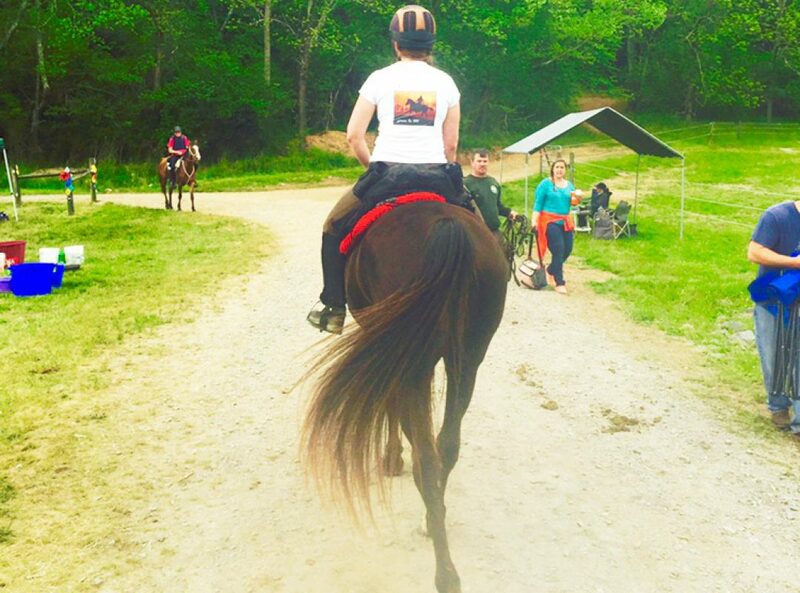 My riding, my balance – using my body more equally in day-to-day life, my internal fitness both in mind and spirit all play a part of my equine-human team. I’m paying attention to all these parts more and more. Though all for the good, these factor in to the whole chaotic system that is my horse’s universe. I tend to overthink as most of you already know. So I watched, I wondered, I analyzed, I had a CST visit and one more follow up trim with my hoof mentor from WV to be certain all was on track. Hoof testers negative and no current laminitc evidence present it was time to move on. I decided to get out and ride through whatever it was that seemed to be nagging at me. Stop overthinking. Throw on those boots and pads and get back on the trails. What was brewing in a little corner of my mind since the clinic last month…. My horse is not lame. She is not falling apart. My Arab-TNWalker-Saddlebred-Rackinghorse is trying to gait. But she’s not sure how exactly. She’s going through an identity crisis. She’s half past 7, I’ve now helped sort out the tack and health/feet issues that were functional but not ideal in the past. I increased her fitness and got my riding sorted out. I’ve opened the door and now all systems are go and she’s got this new gear to try out. And I think she’s starting to have some fun with it! Today we took a short ride but I trailered her off to some nearby trails that are grassy, easy footing, and far enough away from the new boys that have her attention (yes she’s in heat!) and the mustang who calls for her out of temporary desperation and loneliness… so we could focus. Right off the trailer she was ready to go- and I let her move on out to warm up. We hit some overgrown connector trails that she was raring to fly through yet I wanted a sensible speed : she fell right into a running walk compromise. I went from an up and down trot to that back and forth you only get when you ride a gaited horse. In the video it’s hard to see (and hard to help her one-handed) but it’s when her head is more still and then starts going side-to-side. We spent the next couple hours experimenting and had a lot of fun. She was trying out new gears and I did my best to help her. This was what she’d been doing in rides this past month when she felt a mess underneath me- she was trying to figure out how to move in this new gear. Yes I’ve ridden gaited horses before. Faygo is a foxtrotter, I’ve ridden TN walkers, Paso finos, Rocky Mountain horses and saddlebreds… I get it. But none of the ones I rode were sorting it out. They already gaited. This is new territory for me- but was a blast all the same. I’m glad I didn’t push for her to do it before she was physically ready. Who knew that when I left the gaited horse saddle and bit (not that they were bad) and got her toes pulled back underneath her (often the opposite of what you hear gaited horses need) she’d be able to open up that box. The Balance has allowed her back to really come up and she’s in a simple D ring French link snaffle now- no leverage or poll pressure, she’s finding it all on her own! When I help her I only fix my hands on a short rein to my saddle (I don’t purposely collect her per se) and she finds what she needs there. I’m thrilled for her to have an extra gear to use especially heading toward a 100 mile ride at some point. I’ll take every advantage I can get and having more ways for her to use her body is just that. For the moment we’ll play around and experiment- but at some point I will be able to decide what gear/gait we use and how to help navigate terrain and trails. I have no intention of giving up her beautiful trot or canter. And we did walk-gait-trot-canter all in the ride today. It was a nice breakthrough from feeling things were not working right to exploration together. The ride was fun! She was forward the entire time eager to get down the trail. I hope to start working her more physically to get her in shape for Fort Valley in October. She’s been in great shape not long ago so hopefully a couple weeks will bring her back in the game. My only worry at the moment is passing her trot out in the vet check! Lately she does strange things trotting on lead so that will be something to work on… keeping her trot out at a TROT! !